If you have been waiting to get a Magnetospeed… wait no longer. 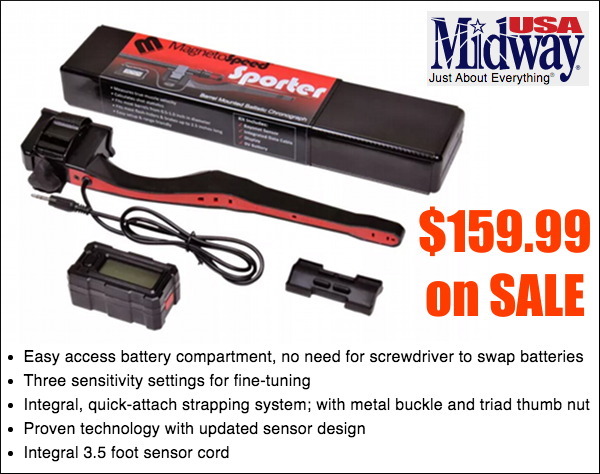 Priced at just $159.99 at MidwayUSA, the Magnetospeed Sporter model costs less than half as much as Magnetospeed’s V3 models. This chronograph attaches directly to your barrel so you don’t have to go downrange to position tripods and set up skyscreens. For most people the Sporter Model contains all the features they need. Using Magnetospeed’s XFR adapter (sold separately), data can be transferred easily from the display module to your mobile device. READ Magnetospeed Sporter Review. NOTE: You need to add the item to cart to see the $159.99 price. This sells elsewhere up to $190.00. This isn’t the first time we’ve featured Lapua brass from Bruno Shooters Supply. But you may want to act soon because prices are going up. Bruno’s is offering very good pricing now for existing Lapua brass inventory. 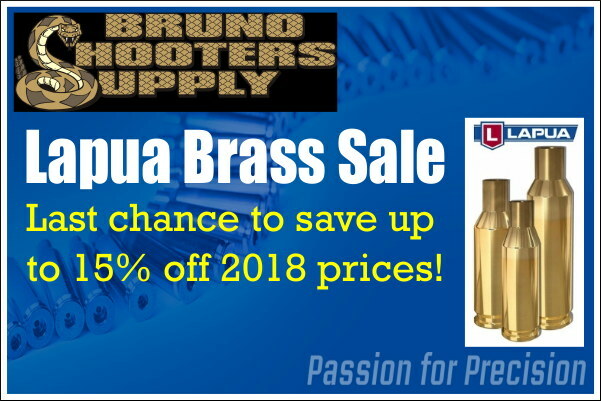 However, Bruno’s managers tell us that future supplies will likely cost more — this will be the last opportunity to get Lapua Brass at low, 2018 mark-down prices. So get ready for the new shooting season and stock up on brass now with Bruno’s favorable pricing. When it comes to rear bags there’s really only a few brands that the pros use and Protektor is always one of them. Protektor leather rear shooting bags are well made, hold up to abuse, and do their job rain or shine. 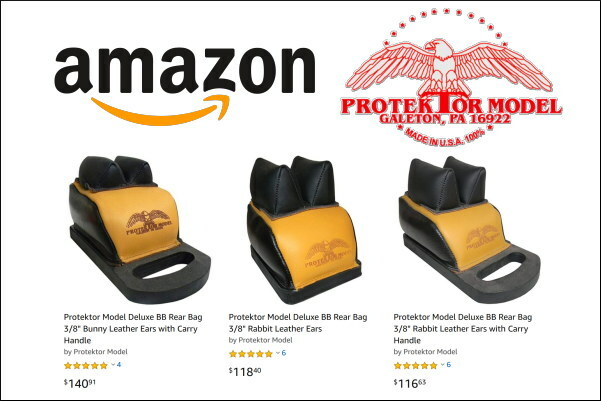 Now you can purchase these quality Protektor rear rest bags from Amazon. That means you’re getting a very competitive price with super-fast Prime Shipping available. if you need a rear bag quickly for that next match, this is a smart option. Here is an awesome deal on the popular Vortex Viper scopes, a top choice for hunters and tactical shooters. EuroOptic has slashed prices on last year’s model Vipers so you can save hundreds. Get the First Focal Plane (F1) 4-16x50mm Viper PST for $499.99. 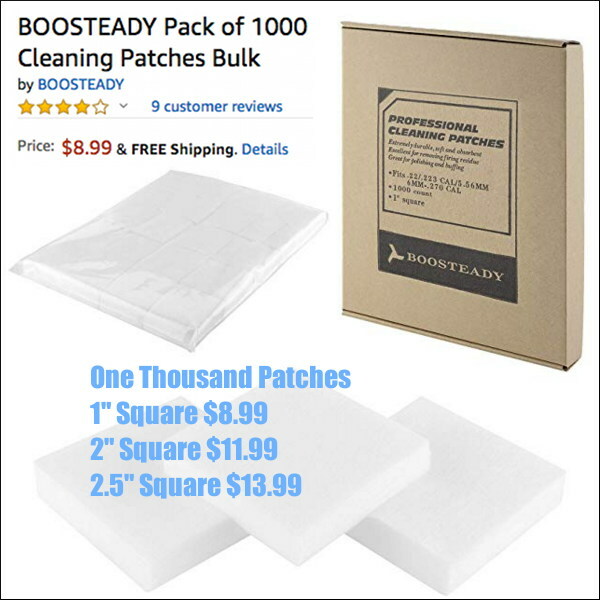 That’s a whopping $400 off the original price. Or, grab the higher-magnification F1 6-24x50mm Viper PST for $649.99, a $300 savings. 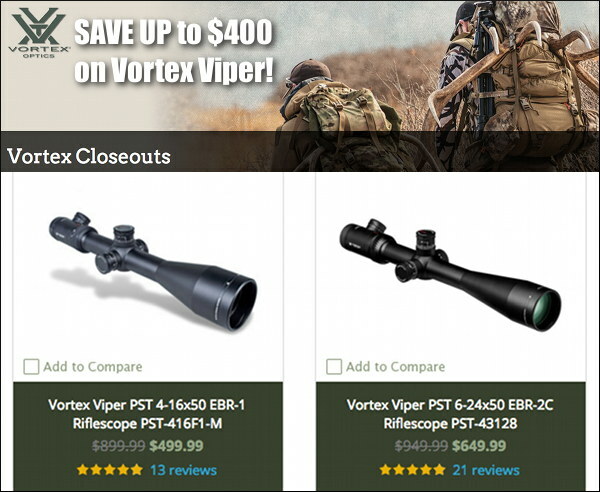 Both scopes have a great reputation, and the Vortex warranty is second to none. Buy with confidence. If you want a true high-end tactical optic, there are also great deals on the premium Vortex Razor HD Gen II 4.5-27x56mm scopes — save $650.00. Who couldn’t use a quality pistol crafted by a legendary manufacturer for up to 45% off? EuroOptic is clearing out its FN America Pistols at super-low prices. Chose from a wide variety of models in popular chamberings such as 9mm Luger and .40 S&W. There are full-size, compact pistols, and sub-compact FN pistols on sale. For example the FNS-40 Compact NMS (.40 SW) is just $339.00, hundreds less than you’d pay for a compact Glock. 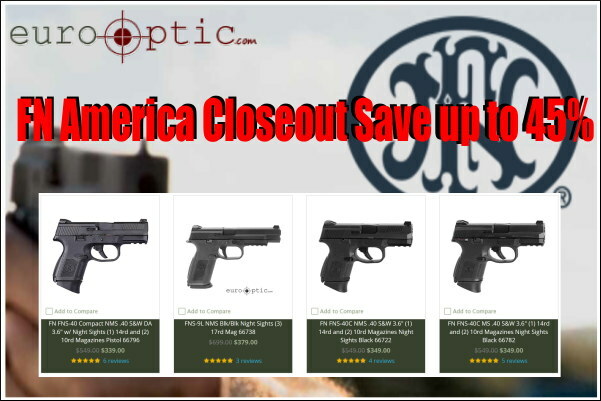 If you are looking for a quality semi-auto handgun for targets shooting or self-defense, check out these deals. Graf & Sons is running a great promotion right now for anyone who is serious about precision hand-loading and long-range shooting. 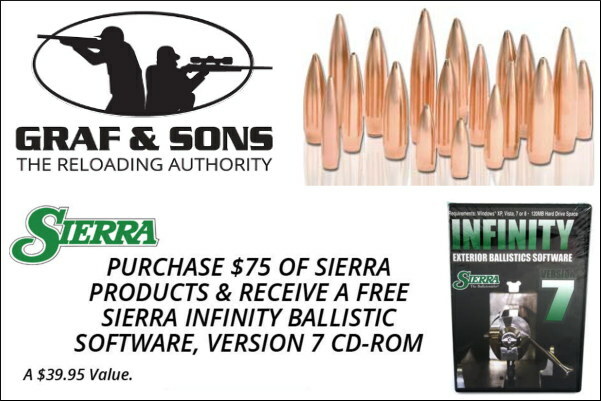 Purchase $75 worth of Sierra Bullets and get the Sierra Infinity Ballistics Software for FREE. That’s a $39.95 value just for buying the bullets you love to shoot anyway. The ballistics program is very sophisticated and includes hundreds of bullet profiles. Anyone can print out paper targets but what’s the fun in that? 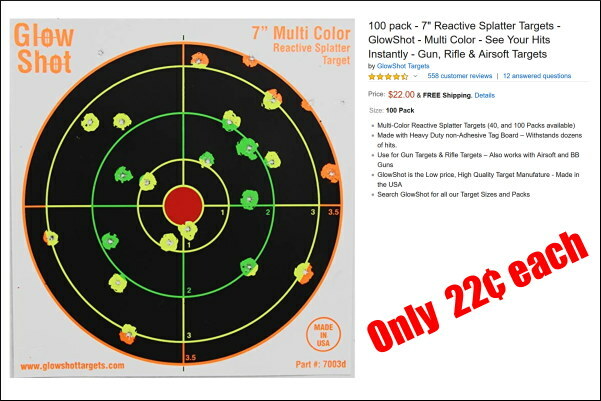 For only $22.00 you can grab 100 of these multi-color reactive splatter targets and know exactly where your shots are landing. A bright-colored Hi-Viz “halo” appears each shot in the black bull. These targets are made of a weather-resistant material, so you can use them in light rain without worrying about them getting soggy or falling apart (as would normal paper targets). NOTE: Reactive splatter targets typically cost much more. With this deal each target costs just twenty-two cents, less than a quarter — a real bargain. Note: You get one set of muffs (either gray or camo, NOT both) for $8.88 plus S/H. Good muffs that offer 27 db Noise Reduction and won’t spoil your cheekweld — for under ten bucks? Can’t argue with that. Right now CDNN is offering a killer deal on Kryptek Sound Soldier 27 NRR muffs that sell elsewhere for around $24.00. Get these in either Highlander Camo or Typhon Grey for just $8.88. These passive muffs have low profile shells engineered to stay out of the way when shouldering your weapon. The ergonomic headband keeps the muffs aligned, in their proper position. Purchasers report the soft leatherette ear seals are surprisingly comfortable. These muffs provide a pretty high NRR considering the low profile design. And the price, just $8.88 on sale, is hard to beat! NOTE: Other vendors have a more conservative 25 NRR for these type of muffs. That’s still quite good. Share the post "Bargain Finder 174: AccurateShooter’s Deals of the Week"